In every chiller cabinet and in every grab-and-go store up and down the country is a rice salad. The best types of rice to use as the nuttier varieties – the ones that hold their shape and bite after cooking – such as regular brown rice, black venere rice and red camargue rice. Below there is a link for a baby spinach, date and feta salad with black venere rice. The sweetness of the dates alongside the tangy saltiness of the feta makes this a real crowd pleaser. And so easy to whip up with mostly store-cupboard essentials. Leftover rice can also be used up for a lunch meal to great effect. Add them to a sweetcorn pancake mix for a delicious brunch or lunch dish with a difference. Our recipe below also calls for a sea bass cerviche to add a little Masterchef quality to the dish! But you could eat them ‘naked’ or pair it with and salad or sauce of your choice. Or have you thought of using rice to make a burger patty? You could either use leftovers (this one here uses leftover risotto!) or we used a pre-cooked pouch or wholegrain and quinoa. Bang on trend folks and perfect for the last of summer’s rays. And finally how about some great picnic fare? Dolmade made with the beetroot leaves. If you don’t grow your own look out for fresh beetroot in the supermarket as these often have the leaves still attached. 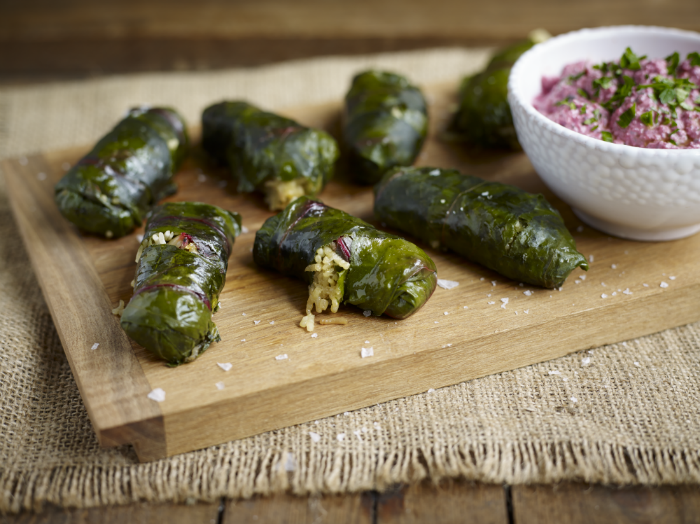 These little dolmades travel well and are delicious at any temperature so really do suit picnics ever so well.